I am against this project! Bring back the cows! This line in the Stamford Times was bad news for me: The annual sculpture and photography exhibit, "Art in Public Places," will be on display this summer in the streets of downtown Stamford, featuring life-size sculptures of artist J. Seward Johnson. I had a disturbing experience with the human statue parade a few years ago. I was driving on Main Street in front of the Ferguson and was startled to see a man in a suit leaning out into traffic... to realize a second later that it was a statue. What the- don’t they realize we are all distracted drivers? 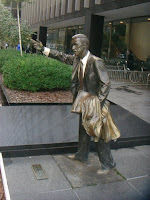 Why place a statue of a businessman who looks like he's in a rush right by a busy street? At least have him turned away from the road, gesticulating to an invisible friend, so no one slams on the brakes because they think he's about to jaywalk. A few weeks later, in the little park across from the Avon Theatre, I saw a statue of a black man with white albino patches on his face, again leaning into traffic and wearing a business suit. That’s an odd choice for a statue, I thought, but it's cool that the human statue parade has a variety of types of people. Just after I passed the statue, he waved to his friend and crossed the road. Geez Louise. It’s a good thing that person wasn’t banking on me stopping to let him cross, because I would have run him right over. The line between reality and fantasy is not clear enough in my mind to be able to handle the life-sized people statues. In the past week, a pregnant Angelina Jolie and scenes from Battlestar Galactica Season One have appeared in my dreams. Two months ago, I was dreaming about Sawyer from Lost because I was stressed out that he was stuck in the cage in season three. For people with overactive imaginations, the human art is not the cute, clever experience it’s meant to be! Let’s bring back the Cow Parade. 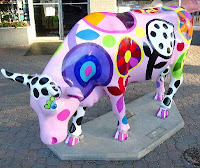 The colorful cows are more obvious works of art, so no one’s going to mistake them for real animals about to wander into a busy street. What I do approve of is a photography competition associated with the human statues. See the Downtown Events website for more info and an application. The general idea is to take photos of people in Stamford that are "full body shots of ordinary life and people that reflect Johnson’s Classic series." I can handle photos. They're flat pieces of paper I'm not likely to mistake for real people. Consider this post your warning to pay more attention when driving in downtown Stamford. Let's just hope they don't place this statue by a road. I'm with you. I've done a double take or two with these statues. And while I found them to be interesting and clever at first, I've just gotten tired of seeing these things year in and year out. Art is about creativity, so why do these same types of statues get rolled out every year? I think the new statues are going to be more creative- like Marilyn Monroe with her skirt flying up... but can you imagine the obscene things people are going to do with her? I think Downtown has recently had an 'art made from junk' display, but my favorite is the cows... I guess all aren't can't be that overtly fun! Eek that bottom one is creepy with the father and daughter - thats like the last scene you see in slow motion before the A-bomb explodes in a movie. I always hit the breaks when I see iconic precusors to apocalypse. Sounds like a truly entertaining idea. However... what out! You never know what you might get! I really liked the "found art" junk exhibit. The cows were done back in the late 90's in Chicago - I think that was the first city to do them. My only issue with the "animals" exhibit is that after the one with the gorillas and giraffes a few years ago, my frigging neighbor BOUGHT a STAR SPANGLED TIGER and installed it in his front frigging yard. I had to look at the stupid tiger for FOUR YEARS until he finally moved. I think it drove down property values in my neighborhood.